To help broaden our reach and better meet the diverse needs of our customers, we have teamed up with other affiliates in the “people-development” business. Our team consists of highly experienced certified coaches, speakers and trainers who have worked in and with a wide variety of Fortune 500 industries which include Consumer Package Goods, Pharmaceutical, Finance, Communications, Technology and more. As we partner with you, you’ll have a highly skilled and uniquely qualified team to help you achieve your coaching and training goals. The benefit for you is one contact point with infinite points of knowledge and experience. 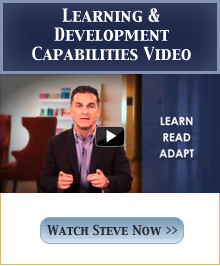 Find out more about Steve and the entire team! Contact us now and we’ll send you an information packet loaded with information on how we can help your team reach new heights.